Ukrainian Developers: What’s It Like to Work with Ukrainian Software Engineers? 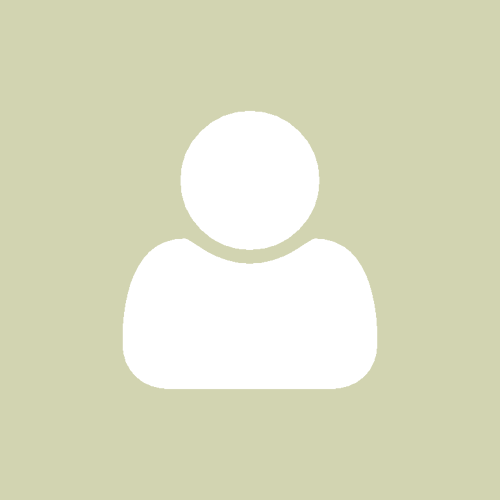 Home Blog Ukraine What’s It Like to Work with Ukrainian Developers? With over 90,000 IT professionals, Ukraine is home to Europe’s largest tech talent pool, but quantity isn’t everything. 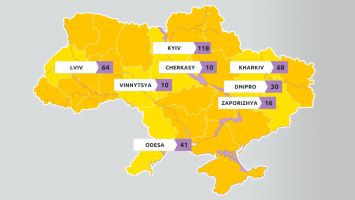 Ukraine’s competitive technical universities, vibrant tech scene, and convenient time zone are also reasons why so many companies are outsourcing to Ukraine. When you decide to hire developers remotely, you need to know whether you can actually find the right kind of talent in the location you’re considering. Luckily, we’ve already written about what technologies are most common among Ukrainian developers. In this article, we take a more personal approach and show you what Ukrainian software engineers are like as people and what kind of work relationships you can expect from your team if you decide to set up your dedicated development center in Ukraine. A few months ago, DOU.UA, Ukraine’s largest online developer community, posted the results of their latest developer survey. The findings include age, work title, experience, education, English proficiency, and many other characteristics of Ukrainian engineers. In the infographic below, we’ve charted some of the data points you’ll definitely find useful if you’re thinking about hiring developers in Ukraine. So what can you expect when working with a Ukrainian developer? Ukraine’s 402 universities and colleges boast over 36,000 science and technology graduates per year – more than many other countries prized for innovation like Japan, Sweden, Norway, Belgium, and the Netherlands, according to the research by the Information Technology and Innovation Foundation. Ukrainian software developers may be smart, but what really sets them apart from their peers in other outsourcing destinations is the level of involvement they take in projects. 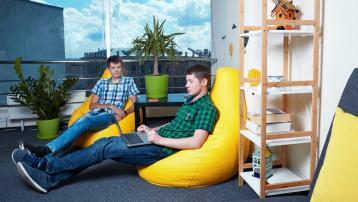 Most Ukrainian tech specialists genuinely love their jobs. In fact, a whopping 82% picked a career in IT because they’re interested in technology, and 48% code after work according to DOU’s survey. Many of those interviewed have pet projects, or volunteer to create software for the causes they care about. If you decide to work with Ukrainian software engineers, expect them to ask clarification questions and disagree with you when they see a better solution. That may mean a bit more discussion up front, but it will ultimately result in a better quality product with a minimum of wasted time and effort. Unlike Indian developers, or developers from Asia in general, Ukrainian engineers have their own opinions, they can disagree with you and explain why it might be better to not go through with a certain feature. I like that. Since nearly 80% of Ukrainian tech workers speak English at an intermediate level or higher, language barriers aren’t really a problem. You should know, though, that just like any other new employees, Ukrainian software developers can seem reserved at first. But, once you’ve had some time to get to know your team, and they’ve had the chance to get to know you, you’ll find yourself in good company. [...] when hiring developers from other countries, one should be prepared for cultural differences and possible communication difficulties with your team. Tatyana (HR/Account Manager at Daxx) helped us to understand each other and to find the right way to collaborate. It took us around four weeks to build a good relationship and start working as a team. Now everything works smoothly. As long as you set clear communication guidelines from day one, your team will start feeling right at home and readily share all of their achievements and concerns with you. How do we know so much about building a productive relationship? It all comes from our HR/Account Managers, who will always be there to help you build effective and trustworthy working relationships with your software programmers if you decide to start a team with us. We agree with Onno – taking cultural differences into consideration when hiring developers from other countries is important. Fortunately, Ukrainians have a Western mentality that makes working with European, American, and Australian businesses pretty easy. Dutch people are quite similar to Ukrainians. The upshot of all this is that if you decide to hire Ukrainian developers, working with them isn’t going to be much different from working with someone local. What’s more, if you choose us to help you build your development team in Ukraine, we’ll help make the setup process and team communication run that much smoother. To set up an offshore development team in Ukraine with Daxx, send us a message using the contact form below. And don't forget to check out the resumes of our software developers for hire.